Let in more light and enjoy more space. If you’re looking for a brand new patio door or replacement to patio doors you already have, we can provide you with a number of different styles for your home in Epsom, Banstead, Leatherhead and Sutton. Our patio doors benefit from an ergonomic design with easy to open functionality and a noiseless glide feature that make them the perfect option for your home. The Liniar profile includes a multi-wheeled ‘air glide’ system which gives it a high performance open and closing function. The built in brushes sweep away debris when the door is being closed and aid its silent action, so that they can be operated at any time of day with minimal disruption. Our patio doors provide a stunning finish with slim sightlines allowing increased natural light into your home. You can also customise your doors to complement your property so that they are bespoke to you and your personal taste. All of our patio doors are tested for security and weatherproofing to make sure they provide the best option for you and your family. They are durable, providing you with a long lasting solution for your home improvement project. Our patio doors have extensive features, such as a multi-wheeled ‘air glide’ system, hidden crash stops and a built-in decelerator. Window Doctor's patio doors aren't just functional, they're safe - which means they can be used by all the family. 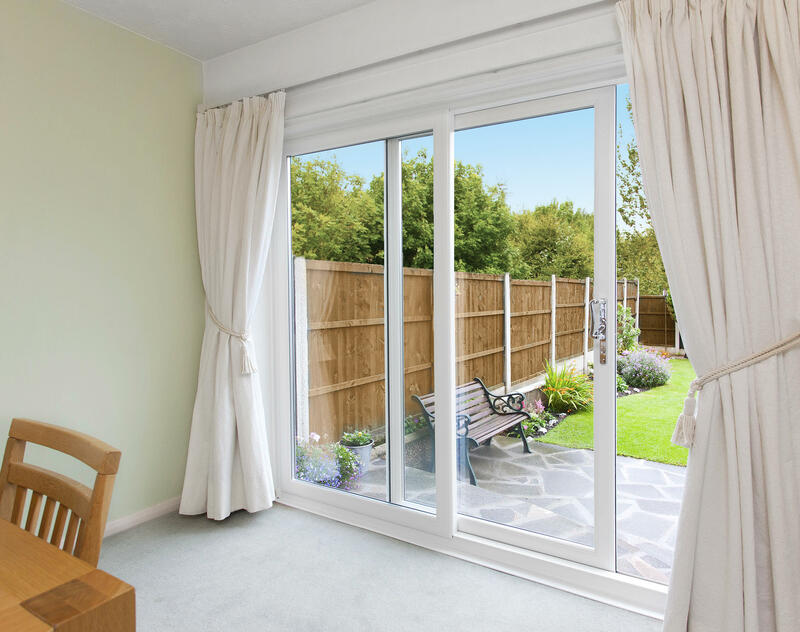 Your patio doors come with a number of options including a choice of handles, low thresholds and more to provide the perfect patio doors for your needs. With easy access and inviting the outdoors in, they are a perfect addition to your home. It’s important that your patio doors are highly secure and because we use the Liniar profile, you benefit from ModLok, which is a modular locking mechanism built into the frame. You will be confident that your home is well protected whether you’re home or not. Our doors are tested thoroughly to withstand any break-in attempts, as well as adverse weather conditions, so you can be sure that your patio doors are up to the challenge. We know that patio doors aren’t a new concept but we do believe that the doors we provide excel in areas that traditional patio doors do not. No need to worry about the door rocking on its track or needing extreme force to open or close, our double glazing is innovatively designed to combat issues that patio doors once had. Traditionally, patio doors are most used during the summer season, allowing you easy access to your outdoor space and to add extra ventilation. However, your patio doors should also be able to withstand the colder months and provide a layer of insulation in your home that will keep it warm and inviting, no matter what the weather. Not only are they a great solution to providing natural light, easy access to the outdoors and creating a focal point in your home they can also be customised to reflect your personal taste. Whether you’ve got a larger space to work with or if you’re after traditional two door patio doors, we can help you create them to the perfect specification. Our patio doors will suit any conservatory, orangery or garden room and can be customised to suit the space they are being added to. You’ll be pleased to know that our patio doors are kind to the environment, with seamless steel sections that are simple to separate and be recycled. You can reduce your carbon footprint by using less energy with our patio doors, allowing you better levels of insulation. Our patio doors don’t need to be treated or painted each year to look good. We also offer a 10-year guarantee, so that you can be confident they won’t rot, warp, split or fade in colour. All they require is a simple wipe down with soapy water every now and then. We have ultra-low threshold options that can make your home easier to access and provide a seamless entrance or exit. Especially useful for wheel-chair users, the low threshold means there is no large step down when leaving or entering the property. Try our quote engine to get a tailor patio door price in moments. Our easy to use design tool allows you to fully customise your ideal patio doors. You will then receive a competitive patio door quote. You can contact us by filling out our online contact form to enquire about the pricing of our patio doors. We boast excellent prices and can provide tailored quotes for your exact requirements.